Born in Regina, Saskatchewan in 1917, Arthur James Donahue showed an early aptitude for design. An only child of a family involved in business and farming, Donahue was educated in Regina, followed by a year in Switzerland. His mother later married a man named Wallace, who was a partner in Wallace and Milne Ltd. Insurance and Loans in Regina. Wallace’s wealth allowed young Donahue to attend the best schools. In 1941, he graduated from the School of Architecture at the University of Minnesota with a Bachelor of Architecture, then with a Masters from Harvard University in Cambridge, Massachusetts in 1942. There, under the influence of Marcel Breuer and Walter Gropius, he gained a strong exposure to the International Style. Donahue was the first Canadian to complete a degree at Harvard's Graduate School of Design. Donahue returned to Canada during the war years and was promptly hired by the National Housing Authority in Ottawa, under the guidance of S. A. Gitterman. During this time, he was involved in creating a touring exhibit “Wood in Canada”, with Donald Buchanan, in 1945. From May to October in 1946, he worked in the National Research Council, later Central Mortgage and Housing, in Vancouver. These positions gave Donahue experience both in design and in the application of new pre-fabricated building techniques that were being developed at that time. 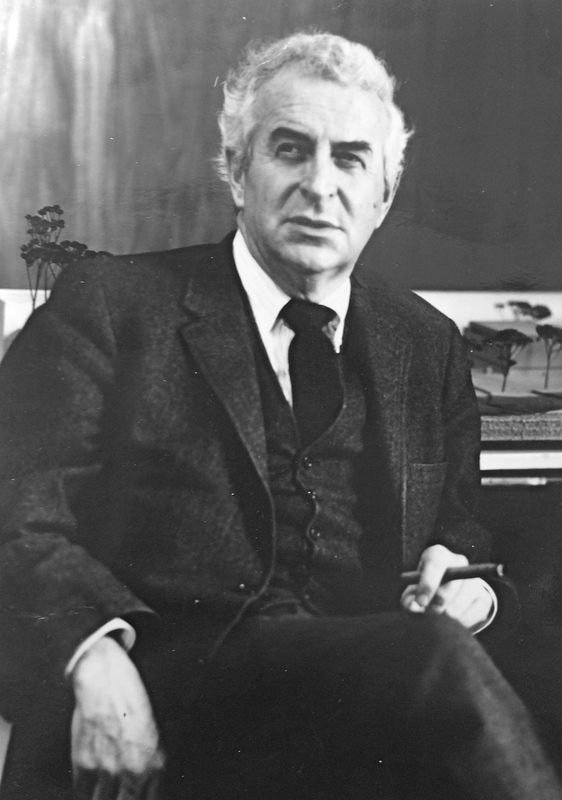 In May 1947, at the age of 30, he was recruited as a professor of architectural design, for the faculty of the School of Architecture at the University of Manitoba by John Russell, as a professor of architectural design. Donahue showed a keen aptitude and interest in furniture design, producing both a plywood-framed web chair in 1945, and a moulded plywood radio cabinet with A. G. Medwin. In 1946, he produced a prototype light-weight fiberglass-stacking chair (similar to the ubiquitous patio furniture of the present) with the support of the National Research Council. Designed in partnership with fellow University of Manitoba graduate Douglas C. Simpson, this chair has been credited as the world's first plastic furniture. Four years later, Charles Eames produced his classic DAR series chairs in the United States, similar in design to Donahue’s. The Donahue moulded chair never went into production. Not long after his arrival in Winnipeg, Donahue designed another lounge chair which he did produce in his basement with the help of his students. With low-slung curved lines made into a plywood shell, the chair was supported with metal rod legs. It was upholstered in fabrics in colours such as mustard, orange and lime green. Originally sold for $35 at the Hudson’s Bay Company, today the chairs are now considered collectors’ items. In 1946, he helped establish the Affiliation of Canadian Industrial Designers, and while furniture design remained a passion, his career took him elsewhere. When applying to the Manitoba Architects Association (MAA) in 1948, Donahue stated that he had worked from May 1947 for a year under K. C. Stanley at the Planning Research Center at the University of Manitoba, which was part of a new program of inter-disciplinary study. In response to the great increase in enrolment and over-crowded facilities, the School of Architecture was reorganizing itself. The departments needed separation, so it was a period of change in which Jim Donahue was a vital element. Donahue was a dynamic and challenging lecturer whom many students regarded as a mentor through his years on campus. He participated fully in campus life, from committee work to studio critiques and as an advisor to Dean Russell on the School of Architecture’s role on the Campus Design and Planning Committee of 1957. Some time before 1951, Donanhue designed a home for his growing family of five at 8 Fulham Crescent in Tuxedo. Period photos illustrate a low rectangular mass with an angled roof and attached carport. When the family outgrew the home, he designed another at 301 Hosmer Boulevard, completed in 1956. The family vacated the old house and lived briefly in the Welgrove Apartments at 375 Wellington Crescent, which Donahue designed and oversaw construction of in 1955. Included in John Graham’s Winnipeg Architecture, the Welgrove is described as having a small reinforced concrete frame, sympathetic in scale to its older neighbors, with lines expressed in glass and masonry panels. The new Donahue residence at the corner of Hosmer Boulevard and Corydon Avenue, was a rectangular form in natural cedar supported on stilts around a raised basement. Although only one storey, the building capitalizes on the vistas and light of it’s raised design, thereby producing comfortable interior space and an inviting exterior. Donahue designed several houses in his career, preferring only natural materials and the use of large windows to integrate the interior with its setting. His philosophical functionalism was always tempered in his residential design. In 1952, Doanhue designed the Niakwa Country Club, located at 620 Niakwa Road. In 1959, he joined the Smith Carter Searle design team, to work on their submission to the Winnipeg City Hall juried competition. Although unsuccessful in that bid, Smith Carter Searle again partnered with Donahue for the design of the Monarch Life Building (1959-63) and the Faculty of Architecture Building, now the J.A. Russell Building (1959) at the University of Manitoba. Donahue is generally credited with being the principal designer for both of these landmark projects. Monarch Life, at 333 Broadway is a 6-storey granite clad, steel frame office building, with prominent vertical lines. The upper floors cantilever over the main level at either end.. The Russell Building which is cited in many studies for its sparse modernistic lines, also floats over its basement with its cantilevered form. It is a persistent grid of exposed columns alternating with mullions that reach through its two floors. With its curtain wall and interior courtyard, it symbolically defined the School of Architecture’s commitment to modernist design. On his own at this period, Donahue submitted an entry in the Confederation Building competition in Charlottetown, Prince Edward Island. in 1961, which Dean John Russell administered. His design was a three-sided development around an historic structure. This project paved the way for him to leave Winnipeg to accept a position in the fall of 1963, teaching at the Nova Scotia Technical College School of Architecture in Halifax, thus ending his career in Winnipeg. Donahue’s practice included several buildings at the Technical University of Nova Scotia (TUNS) which is now DalTech: a university residence (O’Brian Hall in 1970), the School of Architecture Building (1976) and as a partner on the TUNS Design Center in 1985-89. Other projects include the Halifax Police Station (1975), the Nova Scotia Archives (1977) and the HMCS Sackville Theater in 1991. Jim Donahue resided in an old house, which he renovated with his second wife in Chester, Nova Scotia. Later, he built his third residence, again of natural wood, in Lunenberg County outside of Halifax, where he resided until his death in 1996. Donahue, A. J. Letter to Manitoba Association of Architects. 30 April 1948. Donahue, A. J. Letter to Manitoba Association of Architects. 24 December 1949. Donahue, A. J. Letter to Manitoba Association of Architects. 11 December 1963. Graham, John W. Winnipeg Architecture 1831-1960. Winnipeg: University of Manitoba Press, 1960. Kalman, Harold. A History of Canadian Architecture. Vol. 2. Toronto: Oxford University Press, 1994. 811. Macdonald, Catherine. History of Landscape Architecture in Manitoba. Unpublished manuscript. Manitoba Association of Landscape Architects, 1999. 8. Thompson, William P. Academic Influence: A Legacy. Unpublished manuscript. 2000. 8.